As everyone knows, I had been a Ford Girl for 64 years. But after years of my husband having to work on my “F” brand cars—and not happy about it—he finally convinced me that Chevy actually has “a better Idea”. So one day, I was going through old family photos and I came across a picture of us at a picnic, and there in the background was a 1958 Apache pickup that I remember, so fondly, riding in the back of. I informed my husband, that if he wanted me out of my Fords, it would take a ’58 Apache, with the step side and big back window. I know they are pretty rare, so I thought I'd be in my Mustang for a while longer. Nope. A friend in the club found one in Anaconda, Montana. I call him “Pete”, and I love driving him. So now, I’m a Chevy Girl! 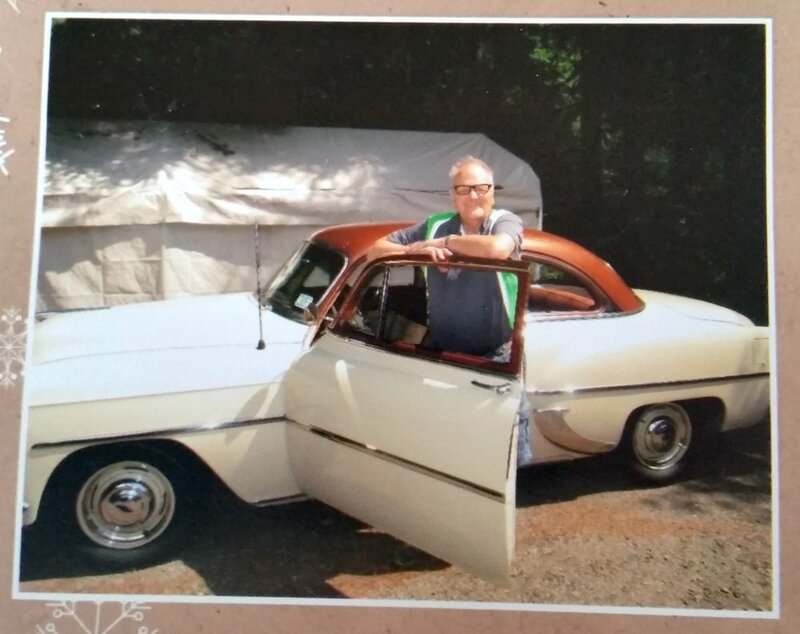 For 20 years, I drove my '57 150 sedan as my work car. I always enjoyed people giving me the “thumbs up” and they’re positive feedback whenever I drove it. We even took it camping one year to Crescent Lake, pulling two jet ski’s, without any problems. I finally restored it, and we now tour in it all the time. I got into the Columbia River Region VCCA because I wanted to join the Portland Swap Meet committee, and to do that, you had to be in one of the six car clubs that sponsor it. So being the Chevy Guy that I am, we joined the VCCA. It has changed our lives for the better, I might add. I found my 1927 Chevrolet One-ton LM series truck in the 1970’s. Over the ensuing years, it has been restored to like new condition with one unique addition. You’ve noticed the huge spark plug mounted in the rear…non-functional of course! I’ve been a member of the Columbia River Region since 1971. Read the full story in the 'Our Stories' section here. I purchased my ‘68 pickup in 1973 and sold my ’62 Impala because it didn’t work as a truck. I joined VCCA in 1980. I needed parts for a ’32 Special Deluxe Sedan, which I bought after my mother-in-law took me to see an old Hudson dealer’s car collection in Wyoming. The coolest guy in my high school drove a '62-'64 Impala...major envy by a lower classman, me! It was black, lowered, mag wheels, and awesome. We looked for a restored '62-'64, and after a year, found this numbers matching, 4-speed, 327 (300 hp) '63. We drove it to the national meet at Lake Tahoe in 2016 and are regulars in the Manzanita 4th of July parade. Garaged all its life, this car maintains all of its original Chevrolet features. I remember how smooth it drove those 14 miles after buying it in 1968. I later drove it to South Dakota pulling a little two wheeled trailer loaded with old car parts. I enjoy showing the car on tours and to neighbors. Two of my children were brought home from the hospital in the Chevy. I've added fog lamps and new tires but nothing else. What a fun project. At 95,000 miles the engine still sounds tight and fit. I guess I have always been a truck guy. Growing up my dad always had trucks of one kind or another, so there always was a truck in the family. In 1999 I bought my first old truck and it was a 1930 Chevrolet 1 ton farm truck. I was working on that truck when I had the opportunity in 2010 to buy a beautifully restored 1931 Chevrolet fire truck. The truck came out of Susanville, CA. It was used in a lumber mill as the company fire truck. It was finally retired in 1990 and beautifully restored by Bob Deaton. When we bought the truck it was in great condition, and we have not done much to it except to maintain it. We have a great time doing parades, block parties, and special events with the truck. Every time that we take it out, we feel we are in a parade because people are waving and giving us the thumbs up. We take the truck out as much as we can because we want others to enjoy it as much as we do. 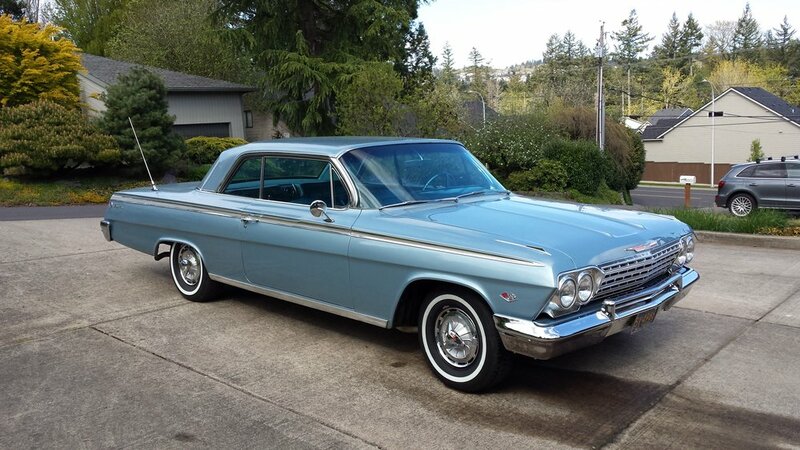 We purchased our '62 Impala SS in 2013 from the Volo Automobile Museum in Illinois. The car was sold new in Lincoln, Nebraska to a couple who kept it 27 years. This car is equipped with the following factory options: 300 hp, 327 V8, aluminum Powerglide trans, Positraction rear axle, deluxe all-weather A/C (includes HD radiator and 42 amp alternator), push-button radio w/ rear speaker, power steering, power brakes, wsw tires, comfort and convenience package, tinted glass, bumper guards, and Super Sport package. The engine and drive train are all original. I completed the restoration started by the last owner, who passed away before he finished it. We take the car on most all of the Columbia River Region tours. We have driven it to all of the Northwest meets since we purchased it. And we took it to the National Meet at Lake Tahoe in 2015. When I joined the VCCA in 1974 I was driving my very first car, a 1962 Belair. At that time the car was not old enough to be recognized by the club. So I bought my first vintage car; a 1933 coupe. In between there was a time that I went Chevy-less for a while. Of course that didn’t last long and I started looking again. When I saw the 1963 Chevy II Nova SS I thought it looked a little like my first car, only a little smaller, so I decided to purchase it. Since then the car has taken me on most of the Columbia River Region tours as well as many NW and All Cal meets. I never thought I would own it for this long, but 2017 makes it 30 years! I was one of the founders of the Columbia River region of the VCCA, watching the region grow from a dozen or so, to now over fifty active members. I've always loved Chevrolets since I was a kid. I remember riding in the neighbor's '30 Chev coach when I was around five years old. The first car I learned to drive was my mother's '31 Chev coupe. Had a lot of Chevs since, from 1929 to 1976. I currently own two Chevrolets; a 1937 business coupe, and a 1953 210 coupe--which I drove to the national meet in Lake Tahoe. But it's not just the cars though, it's the great bunch of people I have met along the way. Are you a VCCA-CRR member and want to add your car to the 'Member Car' gallery? Simply email a short write-up and photo to merryeddy [at] gmail.com and we'll get it up there!